Before the idea for their Korean-Hawaiian fusion food concept was born, Marination founders Roz Edison and Kamala Saxton met in Boston, Massachusetts. Both were passionate educators at a charter school. After a blizzard-filled winter in 2004, Saxon was ready for a change. She had lived in Seattle prior to taking the Boston job, and after a little convincing, Edison agreed to make the move. My mom's side of the family is Korean, and my father's is Hawaiian. I thought, ‘My Korean grandmother would be appalled at the idea of putting Korean marinated meats in a tortilla’ — so, of course, I was fascinated. 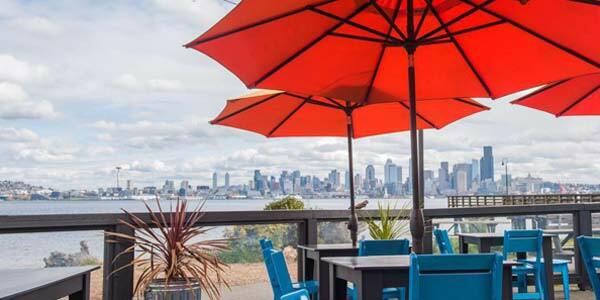 Marination Ma Kai on Alki Beach, with its stunning waterfront patio overlooking Seattle, WA. 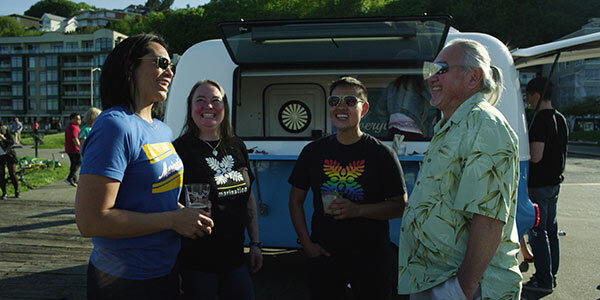 Over the years, Marination grew steadily, expanding from Big Blue to its first brick-and-mortar location: Marination Station in Seattle’s Capitol Hill neighborhood. 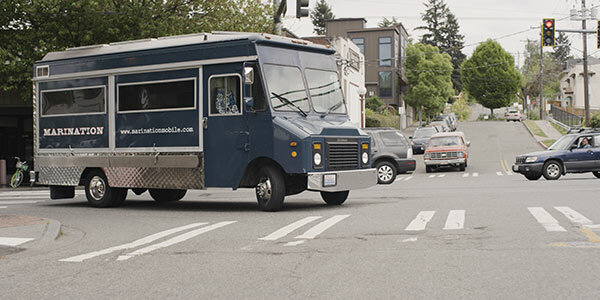 Their two largest restaurants include Marination Ma Kai on Alki Beach with its stunning oceanside patio, and their super cool, full-service Super Six in Columbia City, which serves as the commissary kitchen and offers a killer brunch. By the time Amazon came knocking, Marination was well-known and beloved. “They invited us to be on the ground level of one of their locations, right next to the iconic glass biospheres,” Edison says. “That was a huge honor because they had every food option in the nation to choose from.” In addition, Edison and Saxton are partners in Pioneer Square’s Good Bar, a restored Seattle location serving classic cocktails and local bites. But that’s not the end of their delicious, creative offerings. They’re about to let loose Little Blue, a smaller truck that includes shave ice, plus Tagalong, a mobile luau trailer launching in the summer of 2018. Regardless of whether it’s a truck or a brick-and-mortar location, Edison and Saxton have a knack for turning uncommon spaces into go-to dining experiences that share a distinct aloha vibe. As successful as the business is, an important part of the company’s mission goes far beyond the financial aspect. Both Edison and Saxton are respected leaders in their communities, actively engaging in a variety of meaningful ways. Edison serves as a board member on the Greater Seattle Business Association (GSBA), the largest LGBTQ chamber of commerce in the US, and Saxton has focused her efforts on social issues surrounding LGBTQ, women’s rights and girls’ education. For Edison and Saxton, it’s deeply meaningful to be able to support their employees. Employees may ask for ideas about how to help their kids with their education and they share celebrations, such as their child being the first in their family to go to college. When hardship or tragedy strikes, Edison and Saxton step up to be there for them during those challenges as well. One such hardship inspired them to take action in a big way. Many Marination employees are immigrants. With the current political climate, these employees were scared for their children’s citizenship. “They came to this country legally and were promised something by DACA,” Saxton says, referring to the Deferred Action for Childhood Arrivals (DACA) policy. Edison and Saxton hired immigration attorneys to teach employees what their families should do if they’re questioned or detained. “Supporting them in every way possible — that alone is success for me,” Saxton says. Community members gather around Marination food. While success happened quickly for Edison and Saxton, they faced one ongoing challenge: how to stay relevant. How do you become something that everybody knows, loves and will never forget? One way they’re doing that is by being family-friendly. They’re feeding generations of people who have grown up on their Aloha Sliders. It's all about deepening those roots and building a community for their catering. After thinking about a variety of approaches to its marketing, Marination shifted its promotional strategy by adding digital marketing. Edison and Saxton decided to include Bing Ads to help grow their audience, build repeat customers, and support their catering and luau business. They’ve utilized features such as Broad Match Modifier, a keyword strategy that produces more relevant, high-quality traffic to their site. “I want everyone searching for Hawaiian luau within 50 miles to be able to find us,” Edison says. We love our jobs. We’re proud that we’ve created a company that enables us to give back to the community and causes that we care about. “My life has changed by employing 150 people,” Saxton says. “It’s an honor to be able to do that. Helping people and their families, not just monetarily but as friends and community.” Edison agrees, “We love our jobs. We’re proud that we’ve created a company that enables us to give back to the community and causes that we care about.” Saxton adds, “We’re excited about Bing Ads helping us grow and find new audiences. This business is something that we’re incredibly proud of.” Seattle is proud of them too. View or save the infographic recap to see how Marination used Bing Ads to grow its audience, build repeat customers, and support its catering and luau business.